LAKE FOREST, CA--(Marketwired - Apr 22, 2015) - Just in time for Earth Day, etnies is proudly celebrating the milestone of reaching one million trees in the Buy a Shoe, Plant a Tree program. To celebrate this achievement, the brand is announcing that Every Shoe Plants a Tree in 2015. Every time a pair of etnies is purchased this year, a tree will be planted in the rainforest, representing that individual's contribution and commitment to the planet. Want to see just how big of an impact is made by one tree planted after an individual buys a pair of etnies? The 1,000,000 trees from the etnies' Buy a Shoe, Plan a Tree program will absorb approximately 198,000 tons of CO2 from the Earth's atmosphere throughout the trees' lifetime. 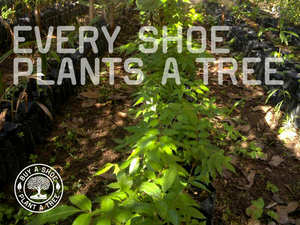 The etnies Buy a Shoe, Plant a Tree project started in 2011 when etnies Owner and CEO Pierre-Andre Senizergues decided to invest in the future by planting a tree in the Costa Rican rainforest for every pair of Jameson 2 Eco shoes sold. The following year, the program expanded to Brazil and the next phase of planting will take place in Africa. Thanks to the help of a partnership through Trees for the Future, the reforestation program has expanded to three continents in five years. "Every day we can vote for the environment through using the right product," says Pierre-Andre Senizergues. "It's because so many people joined us in our commitment to reducing our footprint that we surpassed this incredible milestone. Thank you to everyone -- we're stoked! This is only the beginning and I can't wait to see how far we are going to take this together and make a huge difference for all generations." etnies is committed to being carbon neutral by 2020, and the Buy a Shoe, Plant a Tree program is one of many steps the company has taken toward sustainability. Just in time for Earth Day, etnies is proudly celebrating the milestone of reaching one million trees in the Buy a Shoe, Plant a Tree program. To celebrate this achievement, the brand is announcing that Every Shoe Plants a Tree in 2015. Every time a pair of etnies is purchased this year, a tree will be planted in the rainforest, representing that individual’s contribution and commitment to the planet.